Once again, Japan’s Agency of Cultural Affairs is supporting young animators through the Anime Tamago project. An annual project dedicated to training upcoming animators and showcasing their talents, Anime Tamago can be credited for fan favorites across the globe like STUDIO4℃’s Little Witch Academia, MAD HOUSE’s Death Parade, and TRIGGER’s Red Ash. While project titles had already been previously announced, fans can now see what kind of unique stories this year’s four anime shorts will be bringing to the table. Keep reading to see what Anime Tamago 2019 has in store! 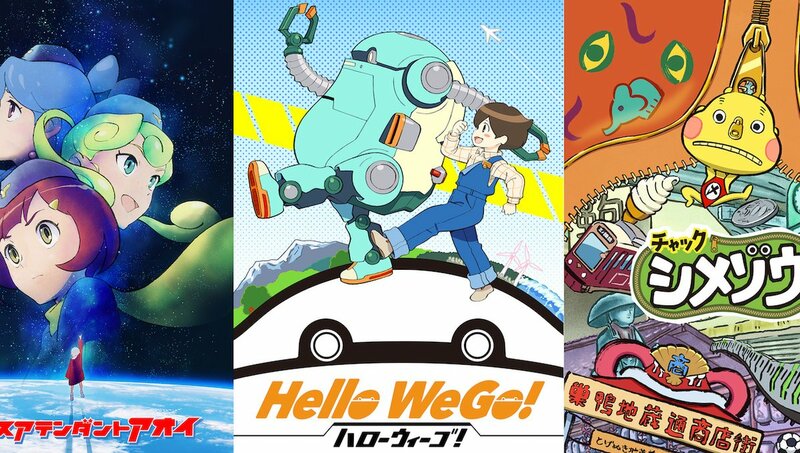 In the world of WIT STUDIO‘s Hello WeGo!, kids can ride and control robots called Mechatro WeGo. Elementary school kid Satoru is gifted an old WeGo by his grandmother, but is unable to take the crucial first step in a race. Nevertheless, it seems his classmate Akira is still interested in going up against Satoru, and thus begins a story of a boy and his robot in a small seaside town. Keica and Griot Groove illustrate a future where the ability to travel space also brings forth the possibility of interstellar war. As a measure against hijacking, “space attendants” are employed, with the story following the self-described clumsy and slow (yet kind of cute!) Aoi. Despite her perceived incompetencies, she’s unusually skilled in martial arts and has just transferred to an interstellar branch. This change leads her to a boy named Leica who claims that his singing brings unhappiness to others. Nippon Animation brings us the story of Chuck Shimezou, who hails from a youkai family with a long history of zipping shut any open zippers that they may find. However, he himself has never managed to do so in his entire life. As fate would have it, one day he meets a young boy named Hiroki who lost money after forgetting to zip his coin purse. After bonding over their nagging mothers, they hit the road for Hiroki’s grandfather’s house. What will happen after they end up getting stuck with his little sister Chie for the journey? Flying Ship Studio’s work follows a poor boy named Bal who lives on a certain island. Determined to change his fate and get rich quick, he hoists a flag up on a ramshackle boat and form a pirate crew. He and his comrades, the pig Pu, the giant salamander Kuna, and his little sister Muge, are pumped to make their mark as a bunch of ruthless pirates. But as time goes on, it becomes clear that they’re failing miserably – because for some reason, all they manage to do is good deeds! A short PV has also been released to get anime fans excited for these four works. With these four imaginative shorts, there’s a lot to look forward to in this year’s Anime Tamago lineup! Be sure to keep up to date at the official website.